With London Fashion Week and Global Fashion Month firmly under way, we have decided to examine the most exciting and interesting jewellery trends for 2016. Here is your guide to find out what has been popular and soared out of our store, and what is set to become a firm favourite during the upcoming autumn and winter season! We may specialise in antique and vintage jewellery and silver, but fashion trends work in a cyclical nature. Therefore, we are able to offer our customers unique pieces from many eras which fit perfectly with the new season’s must have styles. Traditionally masculine and geometric shapes and styles have been in fashion for some time. Women have recently started straying away from the feminine stereotype of delicate and subtle metals and gemstones. This season they prefer their jewellery to pack a punch! Signet rings have been making a strong comeback in both women and men’s fashion. Chunky, retro styles and heraldic engravings providing a vintage feel – reminiscent of the days of gentlemanly graces. When paired with modern accessories, this jewellery can give an interesting twist to a classic accessory. Throughout the 2000s, delicate and slim metal settings have been popularised. As is always the case with trends, however, whatever was formerly popular is now the antithesis of fashionable: suddenly the thicker the metal in jewellery, the better! Large single gemstones as are common in men’s rings and jewellery. 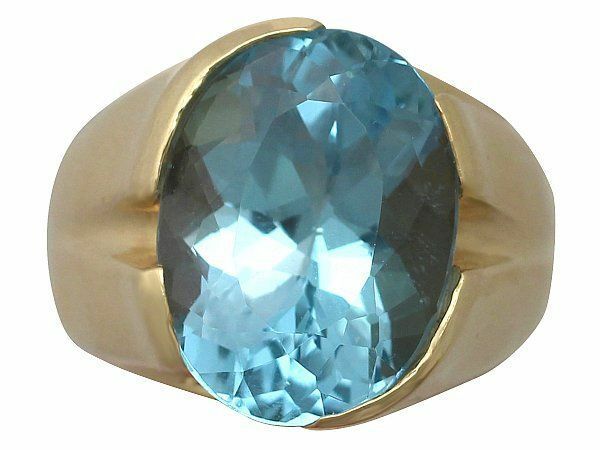 For example, our giant topaz ring. The vibrant blue of this marvelous ring contrasts sharply and beautifully with the yellow gold setting. Collegiate style rings are also in high demand this season. 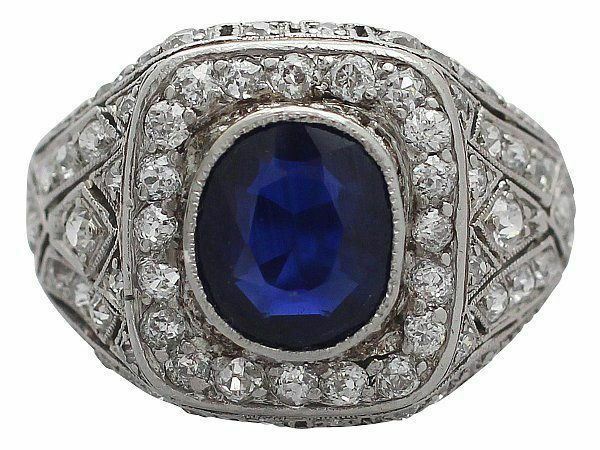 The perfect mix of feminine materials and masculine shapes is combined in this stunning sapphire and diamond ring. With its surrounding diamonds covering not only the edges of the sapphire, but continuing all around the shank and setting of the ring, this ring is reminiscent of the american 1950’s style college ring. Such a ring would have been given to athletes by their school and then, as a token of affection, would often be passed to ‘their girl’ to wear. The trend for jewellery with a masculine edge is not limited merely to rings. There has also been a recent flourish in the popularity of thick, chunky gold bangles, bracelets and necklaces, especially in yellow gold. This style directly correlates with the 1970s inspired fashion trends which we saw during 2016. Vintage and antique men’s jewellery often features thicker and heavier metal settings- due to the need for durability and strength. Watch chains make for the perfect wide, chunky necklaces. The T bar – which was originally meant to affix the chain through the gentleman’s buttonhole- sits centrally on the neck mimicking a St. Christopher’s cross. These chains makes the perfect accessory for any lady or gentleman wishing to add flair to an outfit and repurpose a vintage or antique piece in an original way! Halo rings are without doubt the most fashionable and desirable style of diamond engagement ring this season. All forms of social media are flooded with images of this shape du jour – a central diamond surrounded closely by smaller diamonds in the same shape, standing separate from the large diamond but enhancing its beauty. Although the halo setting feels incredibly modern, it was first devised in the 1920s. When set in the correct way, it can still effectively evoke a sense if the art deco era. 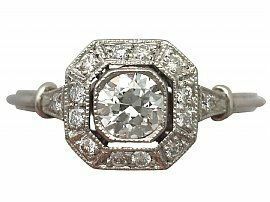 Our stunning antique halo set diamond ring, for example, which benefits from the splendour of antique diamonds, but also features a contemporary halo setting. Cluster style has been considered less fashionable in recent years- after being widely adored in the 1990s and early 2000s. The halo ring however, provides a similar feel, albeit with a slightly neater and more delicate interpretation of the cluster shape. One of the practical benefits of the halo style ring is that the halo can protect the central stone – whether diamond or gemstone – from damage or even everyday wear and tear. Plus, the strength of the setting creates a reliable and long-lasting ring or piece of jewellery which does not feel too delicate to wear daily. At AC silver we are able to offer some wonderful examples of halo set rings, some of which also feature marquise cut and pear shaped central diamonds. This means that your ring will be ticking not one but two of the trend boxes for the upcoming season! As we see every year, fashion looks to warmer, richer and deeper tones during the autumn and winter. 2016 sees the vivid and traditional combination of vibrant green emeralds and yellow gold come into the fashion limelight. Clothing designs, accessories and jewellery will all be using the term ‘jewel tones’ to describe their preferred colour palette for Autumn / Winter. Emerald is commonly considered the most covetable of the gemstones. 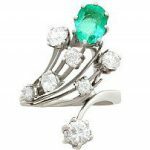 With the recent trend for bright and vivid gemstone jewellery what better stone to choose than the intense and bright green emerald? At AC Silver we are lucky enough to be able to offer our customers some wonderful examples of emerald jewellery. When matched with the warmth of yellow gold, this combination of hues is particularly charming, especially during the winter months! Yellow gold and emerald is a very traditional and ancient combination. 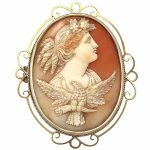 The pairing creates a delightfully antique sentiment, as it was a favoured combination in the Georgian, Edwardian and Victorian eras. Our antique, vintage and contemporary emerald and yellow gold jewellery selection also encompasses some of the other major trends in jewellery for 2016. Our Victorian emerald and diamond ring fits the bill vis-à-vis ‘masculine style’. 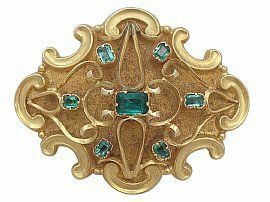 It has a broad gold shank and setting and features some wonderful antique diamonds as well as a large antique step cut emerald. The emerald has plenty of height so as to illuminate the gemstone further! Marquise stones have the privilege of being conceived of by French Royalty. In 1745 King Louis XV commissioned his private jeweller to create a diamond cut which was inspired by the shape of his mistresses lips! ‘Marquise’ is a term regarding hereditary rank. This name was supposedly chosen in relation to the dignitaries who would wear this cut of diamond in a ring to the royal court to demonstrate their standing and devotion to the crown. This stunning antique French marquise is one of our most spectacular examples of jewellery at AC Silver. 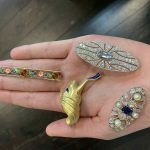 It is incredibly unique and an absolutely amazing piece of antique jewellery. Pear cut diamonds were created in the 1400s by a Flemish diamond cutter called Lodewyk van Berquem. Berquem was also the first to understand the importance of symmetry and facet placement- which has since developed into the complex geometric art which is responsible for the brilliant cut diamonds that we are so familiar with now! 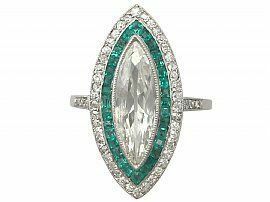 Marquise and pear cut stones have been rising in popularity for a few years. Customers often seek out an unusual alternative to the traditional modern brilliant round cut solitaire, which is traditionally found in engagement rings and in modern jewellery in general. 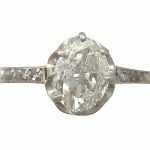 Both the marquise cut and the pear cut result in a stone which is unusual and offers a departure from the ordinary and expected, particularly in diamond jewellery and engagement rings. These distinctive shapes are the antidote for those who are unenthused with the innumerable brilliant round cuts and who are searching for something a little out of the ordinary. Marquise and pear cut diamonds are also less common because there is a greater chance or losing carat weight when creating this shaped stone (in comparison to cutting modern brilliant round cut diamonds). Another, more practical, reason for the increased popularity of the marquise and pear shaped diamond cut is that these stone shapes elongate the finger, giving an overall more refined and elegant impression. The longer cut allows a larger carat weight in the face of the diamond rather than in the depth of the pavilion. This means that marquise and pear cut diamonds give the illusion of a larger diamond than a modern round cut diamond of the same carat weight. We hope that we’ve given you some inspiration for the upcoming season and provided an insight on the intriguing world of jewellery trends and what to expect in the upcoming season! Previous Entry: What is a Candelabrum?